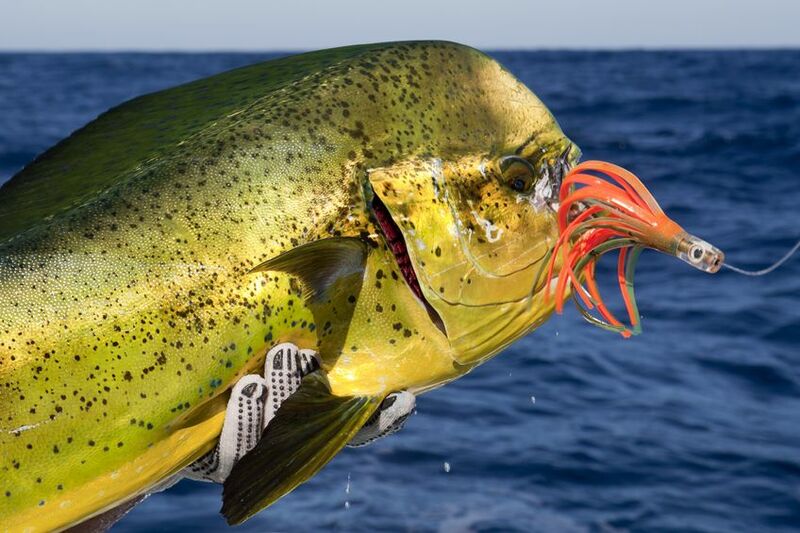 Ok, so you are ready to step up from your current go-to saltwater spinner reel to a reel that offers better quality, performance and corrosion protection. 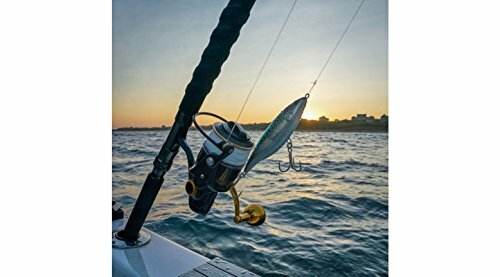 Sooner or later we all get there as our needs or expectations (or both) evolve and catch up to our passion for saltwater fishing. But you’re not quite yet ready for the leap into the Daiwa Saltiga or Shimano Stella kind of performance stratosphere – or price. Well, the good news is that, between the best of the budget saltwater reels and the ultra-premium flagship spinners I just mentioned, there is a sweet spot. This is an area where those of us looking for better performance but also want a good value can feel like we are getting the best of both worlds. The Penn Slammer III and the Shimano Saragosa SW are arguably two of the best spinning reels not named Stella or Saltiga – and best of all, they cost much less. These two reels offer serious saltwater anglers and anyone looking to upgrade to the next level of quality and performance the opportunity to do so without breaking the bank. In my opinion – one that is also shared by many – these are two of the best saltwater spinning reels for the money. But we want to know which is the better bargain – the better value for your money? So, let’s take a closer look at each reel here and see how they stack up against one another and, more importantly, which one most deserves some of our tackle dollars. The Shimano Saragosa has been around for a while, going back to 2008. It has been a favorite with saltwater fishermen from day one due to its quality construction and affordability, making it an attractive mid-priced alternative to costlier, premium saltwater spinning reels. It has only gotten better over the last few years, particularly since joining Shimano’s prestigious “SW” offshore lineup in 2013 – a club that also includes the Stella SW and the Twin Power SW. In fact, the Saragosa SW which comes in 6 sizes, from the SW 5000 to the SW 25000, shares many of the same components, specs and features found in the more expensive Stella SW. Let’s look closer at some key areas. The Saragosa SW’s rigid Hagane body is one of those design features shared with the Stella SW. Made from aircraft-grade, anodized aluminum, and high strength graphite, the reel’s body is light but strong enough to keep flexing under extreme loads to a minimum, giving you not only more cranking power but also a lot more confidence when battling big fish in the surf or offshore. The Saragosa also borrows the Stella SW’s thicker and stronger drive gear (X-Rigid Gear and Hagane) technology. Shimano manufactures its durable aluminum Hagane gears without any cutting to the teeth but is instead uses precision 3D design and cold-forging. This process produces gears that are smoother while also having more tensile strength and durability. The end result is a drive gear that can withstand frequent use in demanding saltwater environments without deteriorating. Other premium features borrowed from the Stella include X-Ship technology, which greatly increases stability and strength between the cold-forged aluminum drive gear and the hardened brass- alloy pinion gear (Shimano’s Paladin Gearing system). This improvement makes it less likely the reel will fail under heavy loads. One other benefit from the improved gear alignment/stability is longer and more accurate casting. Saragosa Saltwater models 5000 to 10000 have 5 treated stainless steel S A-RB ball bearings while the larger 20000SW and 25000SW come with a 6. All models have a “Super Stopper II” single anti-reverse roller bearing which cuts out back-play for faster and firmer hook-sets. 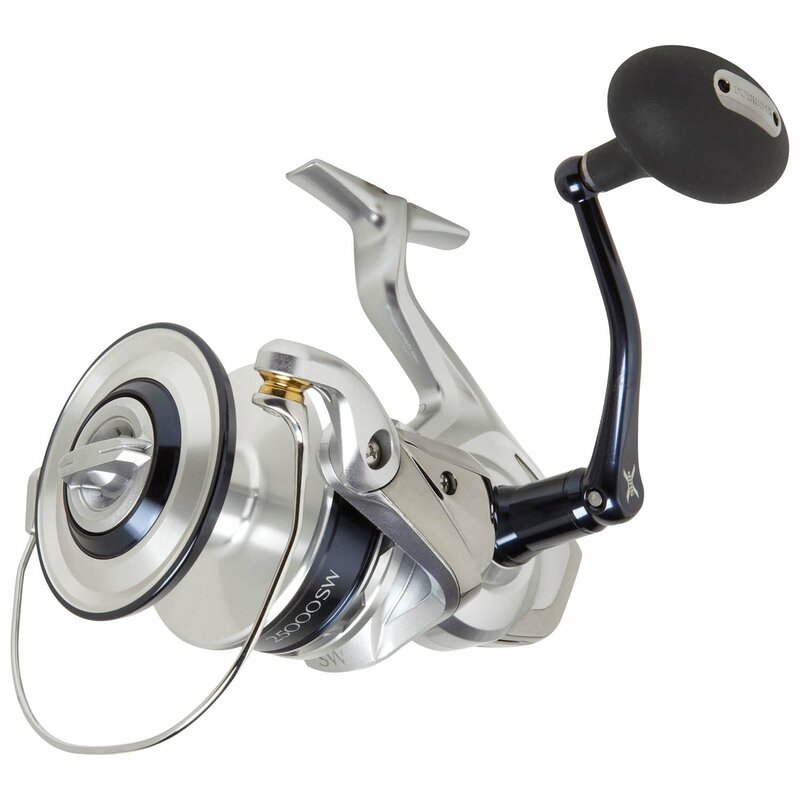 The Penn Slammer III is an exceptional saltwater spinning reel in its own right. This winner of the ICAST 2016 Best Saltwater Reel award is built for power, performance, and durability – with an emphasis on power, as you will see. The attractive gold/blacked-accented Slammer III comes in 8 sizes/ models, from the lean 3500 to the massive 10500. Penn also offers 2 additional high-speed models, the 6500HS and 8500HS (black with red accents). With so many size options, this reel can be used for a wide variety of applications that include surf, kayak, inshore and offshore fishing, just to name a few. 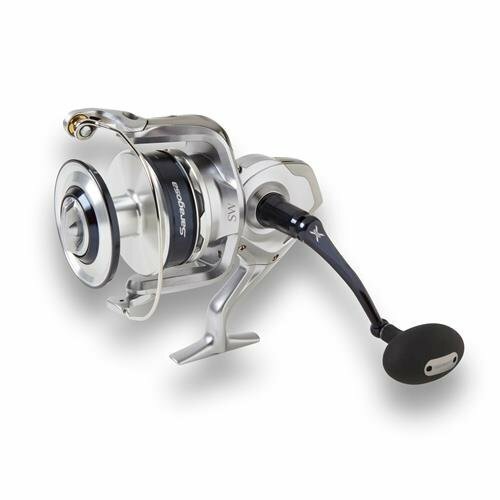 High-quality components, solid performance and impressive specs are at the heart of this reel, and you see that right away in its all-metal frame construction that features a high-grade aluminum body, aluminum side plates, and an aluminum rotor to increase the reel’s performance and life-span with saltwater use. The body, as are other major components throughout the reel, is sealed by Penn’s IPX6 Sealed System to keep water out. Though not recommended for prolonged submersion in water, the IPX6 body seal is effective in keeping gearbox components dry in the face of routine splashes or even the occasional brief dunk in the water. Internally, the Slammer III boasts a full brass gearing system that is manufactured utilizing CNC technology. The choice of CNC brass gearing is a testament to the reel’s overall quality. Brass has long been the preferred material for marine gearing applications because of its strength, friction tolerance and ability to resist corrosion. The use of CNC manufacturing ensures rock-solid performance by producing a more accurate and smoother main drive, pinion and oscillating gear assembly. Each of the Penn Slammer III’s models come with 6 stainless steel ball bearings and a single anti-reverse bearing. The Saragosa is well sealed against water and corrosion by utilizing an effective body seal/gasket (X-Shield/X-Protect) system that protects the reel at 12 crucial points. While not 100% waterproof (if that’s what you’re looking for, get a Van Staal VS or Okuma Makaira), it will handle all the water sprays and splashes you are likely to encounter in the surf or out at sea. In fact, You’d be hard-pressed to find a more saltwater-resistant reel in this price range. At the heart of the Slammer III’s claim to being a serious saltwater spinner is its IPX6 Sealed System that does more than just a credible job of sealing off its internal gears and other components. The gearbox, bearings, main shaft, drag and other major components are protected by the IPX6 system. You should not have many issues when using the reel as intended. This well-designed system provides sufficient protection so that water sprays, splashes, and the occasional dunk should not damage the reel’s internal components or compromise its operation – it was designed for such situations. However, again, I would not recommend submerging the reel under water on purpose for any length of time – it was not designed for that. The Saragosa SW comes with a rigid but lightweight graphite rotor and cold-forged aluminum spool for added strength and reliability. All models have spools that accept both mono and braided lines and come with Shimano’s ” Propulsion Line Management System”. This is nothing but a fancy marketing term that simply it means the reel’s spool lip is designed with a taper that lets the line come off with minimal friction for smoother, longer casts and fewer line issues such as the dreaded “bird’s nest”. Spool line capacities for the series are more than generous. The smallest model, the 5000 SW can be spooled with 240 yds of 10 lb test monofilament line and roughly 245 yds of 20 lb test braided line. At the other end of the spectrum, you can load the 25000 SW, the largest reel in the lineup, with 360 yds of 30 lb test mono and about 630 yds of 65 lb of braid. Being the metal monster that the Slammer III is, it’s not surprising that both its rotor and spool are also made of aluminum. This beast is built for minimal flexing and maximum cranking power when battling big bruisers. Like most of Penn’s spinning reels, this one is also braid-ready and comes with Penn’s trademark line capacity rings, so you’ll always know when you are properly spooled and also be able to see, at a glance, just how much line you have remaining while in the middle of your fight with big fish. The Slammer 3 comes with impressive line capacity specs across its 8 models. For perspective, the Slammer III 4500, which comparable in size and weight to the Saragosa 5000 SW, can accept up to 320 yds of 10 lb mono and 320 yds of 20 lb braid. The massive Slammer III 10500 can be spooled with a whopping 435 yds of 30 lb mono and 780 yds of 65 lb braid! Two words come to mind when I think about this reel’s drag – smooth and powerful. The Saragosa’s drag system is one of the best on the market, regardless of price. Over six models, this front drag reel comes with 22 to 44 lbs of fish-stopping power. The Saragosa SW’s X-Tough Drag system provides smooth handling even at high speeds, making it ideal for big offshore speedsters like tuna, sailfish, and marlin. But there are also other design features that improve its performance. For instance, the inclusion of oversized carbon drag washers near the base of the spool reduces the likelihood of wobbling and improves stability and power. Finally, sealed beneath the aluminum spool by rubber gaskets, the drag system is completely watertight – a welcome feature for any reel that is going to come into frequent contact with saltwater. Regardless of the size you choose, the Penn Slammer 3 offers more than enough drag power to put the brakes on your target. In fact, even the smallest size in the series, the Slammer III 3500, is capable of 30 lbs of drag (13.6kg). The larger Slammer 9500 and the 10500 are just pure beasts, boasting 60 lbs each of lock-down drag pressure – enough to tame just about anything you will encounter in the water! At the core of the Slammer 3’s powerful drag is its Dura-Drag System originally designed for Penn’s high-end International series. The use of a drag system that was previously restricted to one of Penn’s best, heavy-duty conventional offshore reels is in itself something that makes the Slammer III especially noteworthy as a mid-priced spinner. The drag uses 2 massive phenolic-coated carbon washers specially treated washers are highly resistant to heat, saltwater, and deterioration. The washers use a material similar to that found in performance race cars to withstand high levels of friction heat generated by prolonged battles with fast, powerful game fish. The end result is a drag system that Penn says is even better than the highly-touted HT-100 Carbon Fiber drag that is found in many of their top reels. Drag is sealed by Penn’s innovative IPX6 Sealed System previously mentioned. Essentially, if the reel where to be dropped into the sand or is accidentally submerged, all you need to do is rinse it in fresh water as soon as you can. There’s no need to take the reel apart! Both reels come with machined aluminum, interchangeable left/right handles, instant anti-reverse and aluminum bail wires. Bail trip design differs in the two reels. The Saragosa’s bail trip is a manual-only design across all sizes. The Slammer comes with automatic bail trip in its smaller 3500 to 5500 models and manual bail trip in models 6500 through 10500. The Saragosa has a durable, non-slip rubber knob/grip while the Slammer comes with an aluminum knob installed and a spare EVA knob for anglers who prefer a softer grip (also useful for fishing in cold climates). Gear Ratios for the Saragosa range from 5.7:1 for the smaller sizes to 4.4:1 for the two largest reels. The Slammer’s gear ratios across its 8 models run from 6.2:1 to 4.2:1. With all that metal, it’s little surprise that the Slammer III would be heavier than the Saragosa almost across the board. The Saragosa reels weigh from 16 oz. to 34.2 oz. from the compact 5000SW to the very large 25000SW. The Slammer’s smallest reel in the series weighs roughly 14 oz., but that weight increases to a hefty 43 oz. for the 10500 offshore monster. Which reel wins in key categories? Starting from the top I’m going to compare the most important features of the two reels and pick a winner for that particular feature and tell you why I made my choice. Both reels are made from the highest quality components available in the mid-range price bracket. The Saragosa SW has a hybrid body made of an anodized aluminum frame and graphite side plates. While I’m usually hesitant about graphite in the body, the graphite used here does not compromise its rigidity as it is only a small percentage and in the side plates only, not the entire body. There is minimal flex in the body while under load. In addition, it contributes to a lighter-weight body. Having said that, I prefer an all-metal body in a saltwater reel, especially when we get into the larger offshore sizes. The Slammer III’s body/frame is 100% die-cast aluminum. It’s going to be stronger and more stable than a hybrid design, which will be a plus when battling big, fierce offshore game. Sure, it could have been made of machined aluminum for added strength but then I would not be reviewing it as a mid-priced reel because it would be beyond the price range. I still like metal over graphite – it is the sturdier material. The internal gears contribute greatly to the overall strength and durability of a spinning reel. For reels designed for saltwater use, they become even more important. The Shimano Saragosa SW’s drive gear is 3 D designed and made using cold-forged aluminum. Cold-forging is a process by which certain metals, in this case, aluminum, are forged or formed at or near room temperature, giving them greater tensile strength and durability. The combination of 3D design and cold-forged aluminum (Hagane Technology), creates a lightweight but stronger and more precise drive gear without having to cut the teeth. This is a superior process to die-casting. Paired with a hardened brass pinion, which Shimano markets as their Paladin Gear System, the whole drive-train is made smoother and better able to cope with the stress of routine battles with trophy size game fish. Penn approaches their gearing with an all brass design. All Slammer III sizes use CNC machined marine-grade brass in the drive, pinion, and oscillating gears. 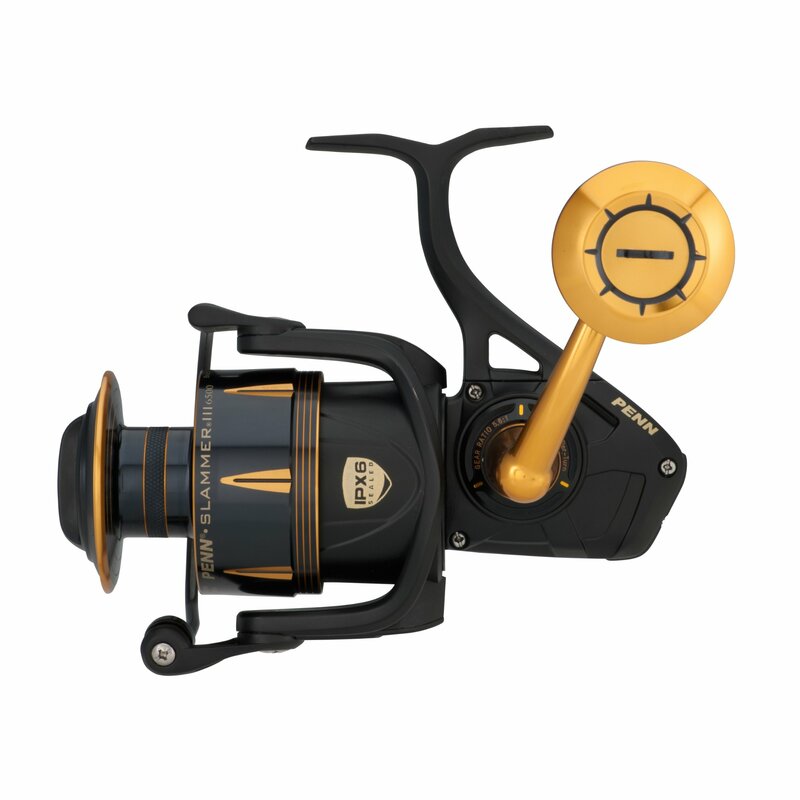 Brass is the preferred material in higher-end saltwater reels due to its low friction and anti-corrosive properties. CNC machining makes the gears more accurate with higher stress tolerances. Yes, the Saragosa’s Hagane aluminum drive gear is light yet strong, but manufacturing processes and fancy marketing terms aside, I like brass gears over aluminum for saltwater gear applications. Brass is heavier than aluminum but it is also harder and stronger and more than aluminum. It is for this reason, I imagine, that the Saragosa SW uses brass in its pinion gear, since it has to work much harder than the drive gear, thus requiring a more durable material. The Saragosa SW comes with 5 stainless steel, shielded ball bearings and 1 anti-reverse roller bearing in all sizes except the 2 largest models, the 20000SW and 25000SW, which have 6 ball bearings each. The Slammer III has 6 sealed stainless steel ball bearings and an anti-reverse roller bearing in all 8 sizes/models. There is little difference between the two reels bearing count, and quality of the bearings between comparable – they both use the best bearings materials short of ceramic. Both the Saragosa and the Slammer are well protected via seals and gaskets from normal water spray and splashes. But the Saragosa’s X-Shield system has been around longer and is proven. I’ll keep this one brief as both reels are well sealed against water, sand and other debris. Each uses their own proprietary sealing systems (X-Shield in Saragosa and IPX6 Sealed System Slammer) in the reel’s body and other crucial points effectively. They’re both very good at sealing water out of key components. But the Saragosa’s X-Shield system is another premium feature borrowed from Shimano’s best spinning reel, the Stella SW – it’s a tried and true system that keeps water out. The Saragosa is sealed at 12 critical points, making it as close to being fully sealed as you are going to get in a mid-priced spinning reel. Shimano went with weight-savings in its rotor design by using a rigid yet light graphite rotor while Penn went with the heavier but more solid aluminum rotor. I don’t think the rotor composition makes much difference in the smaller inshore size reels. But if we’re talking fishing for big fish offshore I’ll take metal over graphite. Sure, it contributes to the weight of the reel, in particular, the larger sizes in this review, but when we’re talking about the big blue water species, the importance of having the added rigidity and strength that aluminum provides over graphite cannot be overstated. They both have quality aluminum spools on all models, so it’s a close call between the two. But I like the Saragosa’s cold-forged construction, which should be more durable. The Saragosa’s tapered spool lip design, fancy marketing aside, makes it better for smoother and better casting. The tapered lip should also help eliminate many issues such as line snags and twist coming off the reel. The Slammer’s line capacity rings are also very nice, though not an important advantage, as far as I’m concerned. This is a tough one because both reels have excellent drag systems in their own right. Both reels have powerful, sealed drags that are also smooth. The Saragosa has the X-Tough Drag and the Slammer the Dura-Drag. Both are smooth and powerful but each emphasizes one of these qualities to a greater degree. While the Saragosa’s drag is powerful enough for most types of fishing, topping out at 44 lbs (20 kg) of drag for its two largest models, it is the smoothness and control that many anglers like about it. Having a drag that doles out fishing line evenly and in a controlled manner during a long, hard fight can be the difference between success and failure whether targeting tarpon from the surf or yellowfin deep offshore. The Saragosa SW’s drag is one of the smoothest and very best in any price range. The Slammer on the other hand, while also having a relatively smooth drag, tends to emphasize power. The 9500 and the 10500 put out 60 lbs (27.2kg) of drag – that’s no joke! If you’re going to do battle with the biggest and meanest fish miles from shore, I can’t think of a better spinning reel. Those over-sized Dura-Drag washers will certainly earn their keep when you have to put the brakes on big. But like I said at the beginning, this one is a tough call. I all comes down to how you fish and what your fishing. What do you need more, ultra smoothness or raw power? It’s a personal choice. Final Thoughts: The Better Reel or the Better Deal? Ok, time to put it all together and pick a winner. That’s not so easy when you have two reels like these that are both so good. I don’t think you can go wrong with either of these reels in terms of quality and performance. Each has its strengths and shortcomings, but they are two of the best mid-tier reels in the saltwater spinning space, in my opinion. But both are almost evenly matched and picking the better reel between these two exceptional offerings ultimately comes down to personal tastes. For many saltwater fishermen, the Saragosa’s smooth, premium performance built on top-notch components and features, many of which were borrowed from perhaps the best high-end saltwater spinning reel on the market today- the Stella SW – make it the logical choice. Others, however, will like the Slammer’s all-metal, battle tank design, and outrageous drag. This is a workhorse that can be used for jigging, botting fishing, trolling and just about anything else in the open water. For me personally, If money was no object, I would lean toward the Saragosa SW. It has been on the market a little longer and has had time to prove itself. Many see it as the best all-around saltwater reels around in terms of quality, performance, and durability in this price range. Either way, it’s a close call. But like most people, I too love a great bargain, and the Penn Slammer III certainly delivers on that front. Though it is in the same league as the Saragosa in almost every way, its current lower price makes it the best valued mid-priced saltwater spinning reel today. In the Slammer III, you get a well-sealed, full metal spinning reel with CNC brass gearing and a high-end, lock-down drag system at a cost that leaves you with enough dough in your pocket to spool your reel with some good braided line and perhaps a fishing lure or two. Sealed "Dura Drag System" w/ Phenolic-Coated Over-Sized Washers: 30 - 60 Lbs of Drag! This entry was posted in Tackle/Gear Reviews & Guides on December 11, 2017 by Avid Angler. I’ve learned the hard way the importance of having equipment that holds up to the corrosive effects of the saltwater. These reels look like they do a good job doing so (more so than some others). I couldn’t have said it better, Nelson. Invest in quality and you’ll have fewer headaches down the road. I already have two Sargosa’s. The 10’000 SW and the 20’000 SW both are fine reels . I would now prefer to buy the Penn Slammer but have a concern that the fairly limited spool depth, without a taper, will reduce casting distance. Hi Neil, thanks for stopping by. I hear the surf fishing in South Africa is phenomenal. As for the castability, I wouldn’t worry about it much. While it may not have the Saragosa’s tapered lip, the Slammer 3’s larger spool is a benefit to casting. I doubt you’ll notice a huge difference in distance and you’ll be thankful for the all-metal body when you hook into one of those monsters in the surf! Also, what type of line are you using? I already have a Van Staal and I was looking for a quality reel as my backup. I was very interested in a Saragosa but could not find a review I would consider thorough enough. That was until I stumbled upon this review. Wow, I must say this is one of the best I’ve ever read and it’s evident the author is extremely knowledgeable with his topic. He explained the technical specs of the reels in a way that your “average joe” could understand. After reading this article, I’m really excited about the Penn Slammer III Spinning Reel. I’m an engineer and I know that a good gear system is important. I don’t really mind that it is a little heavy, Penns tend to be anyway. I’m mainly interested in the heavy-duty drag and metal body for deep sea excursions.